It's symphony weekend again for the fetching Mrs. B and I, and we are really looking forward to hearing our great Houston Symphony Orchestra perform along with piano virtuoso Garrick Ohlsson, who the Houston Symphony website describes as "a titan among the titans of the piano", one of the most melodically beautiful and expressive concertos in the repertoire, Frederic Chopin's Piano Concerto #1. This concerto is the feature of the concert program that will be conducted by guest conductor Robert Spano. I have previously called the Romantic Era Polish composer and virtuoso pianist Chopin, Mister Piano, because he may be the most prolific composer of piano music, mostly for the solo piano pieces, and certainly the most prolific composer of melodically beautiful piano compositions, in my unprofessional opinion. Quoting from the Tales post of "Mister Piano": "This virtuoso of the piano was a master at composing beautiful romantic piano melodies. While most of the masters were virtuosos in more than one instrument, that is not true with Chopin. Piano was his instrument. For that reason Chopin did not compose many pieces that contain orchestral music or even any other instruments. Chopin composed only 6 pieces that contained other instruments with the piano. He composed two beautiful piano concertos, and 4 chamber music pieces, 3 for cello and piano and a trio for violin, cello and piano. Other than those pieces, every other composition of Chopin was for solo piano. He was prolific in his solo piano compositions with Etudes, Nocturnes, Polonaises, Sonatas, Preludes, Impromptus, Scherzos, Ballades, Mazurkas, and Waltzes. Yes, it is true that most of the other great masters had many more great orchestral works and chamber pieces than Chopin, but not many of the other masters can come close to the so many beautiful solo piano compositions of Frederick Chopin. Frederick Chopin is indeed, mister piano." Chopin's Piano Concerto #1 is truly one of the great and most beautiful of the piano concertos. This concerto was scored in E-minor with the typical 3 movements for a classical concerto: 1. Allegro Maestoso 2. Romance - Larghetto and 3. Rondo - vivace. Please turn up the volume to hear Mister Piano's beautiful piano concerto, that Mrs. B and I will be hearing tonight in Jones Hall. This You Tube version, thanks to xelarutra, has Zubin Mehta leading the Israel Philharmonic Orchestra, with soloist, Evgeny Kissin at the piano. Note: One of the more beautiful sections for the piano you will ever hear begins at the 6:50 mark in the first movement and then again in the recapitulation of the first movement at the 17:15 mark. 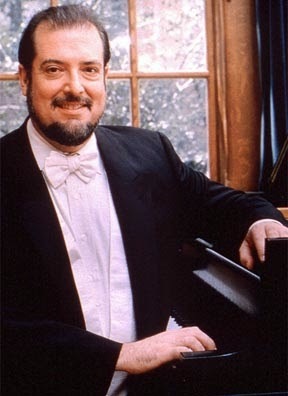 Now here is the great virtuoso pianist we will hear tonight, Garrick Ohlsson, performing Chopin's brilliant Polonaise in A-Flat Major. Update April 19, 2015: Bravo and thanks to guest conductor Robert Spano, soloist Garrick Ohlsson and the world class Houston Symphony Orchestra for another wonderful concert. And also a special thanks to modern composer Jennifer Higdon who not only composed the first and final piece of the program, Blue Cathedral and Concerto for Orchestra, but she gave the prelude talk that my wife and I really enjoyed. We found out that she is a prolific composer and is one of the most, if not the most, widely played around the nation. In fact, her Blue Cathedral, was not only being played in Jones Hall but also another concert hall this week and also is going to be played in Houston's HSPVA [High School for Performing and Visual Arts] in their recital soon. A side note, I am so proud of my daughter Ebony who went to and graduated from the extremely competitive HSPVA as a classical pianist. This piece is so popular as a modern composition, I believe she said it has been played 300 times around concerts in America and I believe around the world. She said she only gets to attend about 10% of the performances so that made Houston concert goers feel special that she came to attend and discuss her piece to us. Jennifer said that one week after she was commissioned by the Philadelphia Orchestra for what turned out to be her piece Blue Cathedral, her wonderful brother had died from skin cancer. She dedicated the piece to him and explained how she developed the piece for him. My wife was really moved by this and she really liked the piece. Also, what a treat to see the virtuoso pianist Garrick Ohlsson. What a magnificent performance of the beautiful Chopin concerto. This is a very big man, but he plays with such extreme exquisiteness and touch, it is really something to behold. Now I see why the HSO website described Garrick as a titan among titans of the piano. Thanks again to all for another wonderful concert at Jones Hall in Houston. Bravo!